On Tuesday. 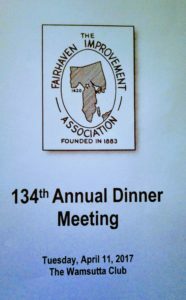 April 11,2017 the 134th Annual Dinner Meeting was held at the Wamsutta Club in New Bedford. Our guest speaker for the night was James Russell, President and CEO of the New Bedford Whaling Museum. Awards were given for Public Service and for Business Beautification. To see all the awards and read what we have done for 2016 click on the picture below.